There are a lot of parking spots downtown and way too many planned for the future. But these drivers apparently can’t find one, so why not squat in the bike lane on Wynkoop Street in front of Union Station? Sure, they’re forcing people on bikes (not to mention other cars) into often chaotic traffic. But at least the drivers, or perhaps the passengers they’re picking up, won’t have to break a sweat by walking a block or two. Luckily this #StreetFail might have a happy ending. 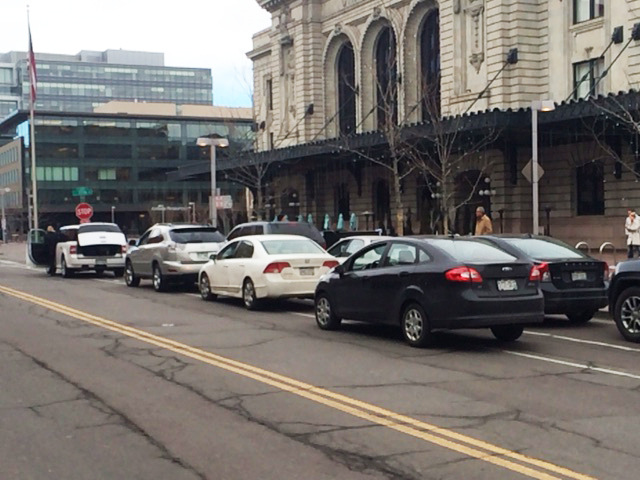 Denver Public Works plans to redesign Wynkoop by April to prioritize people biking and walking, including bright green paint and posts to keep car traffic out of the bike lane. We’ll be sure to update you if this #StreetFail becomes a #SweetStreet. Thanks to Sam Lauer for sending in this #StreetFail. Got a picture of something that’s making Denver’s streets better? Worse? Share it on Twitter or Facebook with the hashtag #SweetStreet or #StreetFail, and we may share it on the blog. You can email me as well. The bike lane should be between the parked cars and the sidewalk. It should be protected by bollards or the curb should be extended. That section is part of my commute home; while this is an unusual number all at once, it’s a daily occurrence. The valet parking guys for the Crawford think the bike lane is a great place to park their courtesy Tesla, as well as stand in. I’m excited to see there’s some plan for improvement. I’d be really in favor of aggressive ticketing right around peak commute times along all the bike lanes Downtown, as I see cars parked in sharrows for pickup quite often. wow the new paint has done an awesome job of giving drivers more white lines and bike lane to cross…. 17th and Wynkoop now forces the bike lane over into the car lane and the cars obviously don’t care what paint in on the street.